You’ve graduated and landed your first job – congratulations! Starting work can be a daunting. You’ll have to get used to a new environment, new people and new rules. Wouldn’t it be great if there was some guidance to get you through it? We have manuals for laptops, smartphones, and, of course, flatpack furniture, so we put together some step-by-step instructions to help you navigate those potentially awkward moments at work. 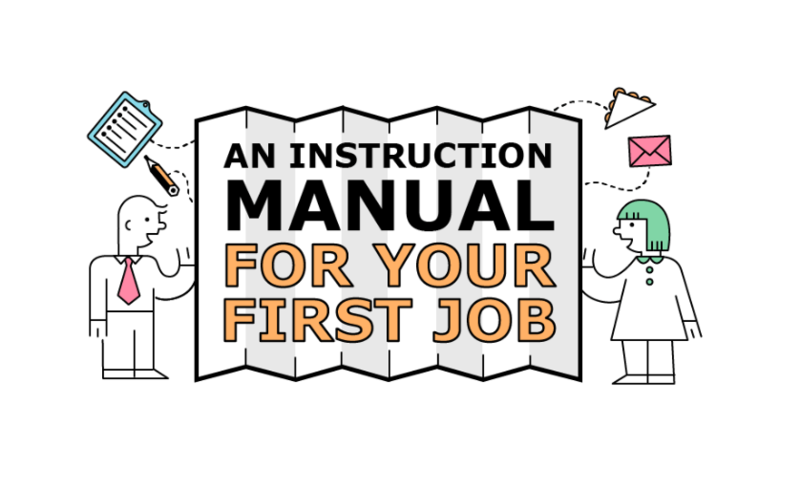 From introducing yourself, to after-work socials, here’s an illustrated guide to your first job. There’s no way out of this – starting a new job means that you’ll be introducing yourself, over and over again. Having a prepared 30-second primer that explains who you are will make this process a whole lot easier. It should quickly dispatch all of the essential information about yourself to your new coworkers – where you studied, what you majored in and what you’ll be doing in your new role. Just remember to speak enthusiastically, no matter how many times you have to say it. Your first team meeting is bound to be a nerve-wracking experience. The key to making it go smoothly – Be prepared. Note any topics you’d like to cover or questions you want to ask beforehand. Listen carefully to what’s being said, and don’t be shy – speak up if you have something relevant to add. Whatever you do, don’t forget to silence your phone. And even if the meeting is a little dry, it’s probably best if you don’t show your new coworkers how bored you are. Any presentation calls for careful planning and a healthy dose of confidence. Remember: Practise, practice, practice. Memorise your main talking points and rehearse your presentation with friends. Ask for honest feedback so you can iron out any problems. During the presentation be sure to speak up, enunciate and smile proudly. Talk to one person at a time and make eye contact. No matter how comforting it may be, resist putting your hands in your pockets if your nerves start to get shaky. No matter what your role, the day will eventually come when your boss takes you aside for some real talk about your performance. It happens to the best of us. Bite your tongue and don’t react as you receive the feedback. You might feel hard done by, but it’s important to look the person in the eyes and listen carefully. Ask questions so you can deconstruct things, then implement the suggestions into your future work. Believe us – feedback is a good thing if you approach it in a positive way. Asking for help can be a delicate matter, especially if you’re the newbie in the office. But if you do it in the right way, there shouldn’t be any problems. Seeking help when you need it makes you look proactive and helps you get the job done – so you really have nothing to lose. Remember – it’s ok to admit that you’re stuck. Don’t sit around waiting for someone to help. If you really can’t solve the issue yourself, ask around. Performance reviews can be daunting, and none more so than your first one in a new job. But remember, this review is an opportunity for you to find out how you’re doing in your new role and how you can improve. It’s your chance to find out if you’re picking up the job as quickly as your boss expects, or if you’re falling short of expectations. But remember – stay positive and refer back to our Receiving Feedback instructions if the feedback is not exactly what you want to hear. Landing your first job is just the beginning, and starting work brings on a whole new set of challenges. This manual should make it a little easier to hit the ground running and get your career off to a stellar start.